Twenty Rotarians were present to hear speaker Duanne Martin, the Town Engineer. He distributed a street map which showed the progress in repairing our streets. He discussed the plans for prioritizing the repairs as well as the sequence, MDC’s role in the repair, and the difference between asphalt and granite curbing. Rotarians had questions about the streets near their houses.
. Steve Leone, the former Wine Cellar owner was present to discuss the Wine Cellar’s role in the March 9, 2019 Vines of March set up and system for placing orders. 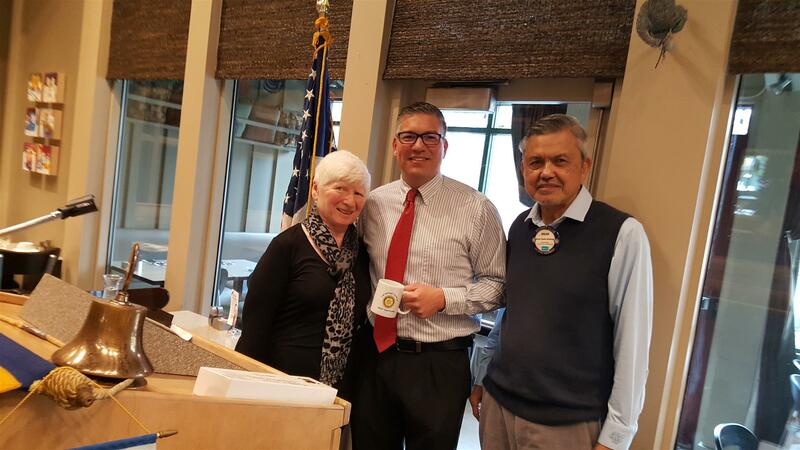 Paul Harris award pin was given Kove Schwartz for his time and effort spent in furthering the goals of Rotary. Tony Rodriguez announced that the Jazz Brunch had a net of $7,200. His efforts were given a resounding applause. Our efforts to eradicate polio remains a main objective for the Rotary Foundation. We still have a way to go in keeping the world healthy, safe and educated. Please donate. Rotary Means Business has a meeting in Avon coming up. Check your email for particulars.